ADDRESSING the trend toward higher system power requirements and lower dc voltage levels in communications systems, Vishay subsidiary Siliconix, distributed by Braemac , has announced three new PowerPAK power MOSFETs intended for Point of Load (POL) dc-to-dc conversion applications in fixed telecom systems. As POL devices, the new Vishay Siliconix MOSFETs are designed for use in low-voltage step-down applications in 5-V and 3.3-V distributed bus architectures. Because switching the low-voltage rail on the secondary bus tends to cause the highest switching power losses within the system, it is important to use devices with low breakdown and gate-to-source voltages. The low VDS and VGS ratings of these new devices ensure minimal on-resistance and gate charge, resulting in better switching efficiency for this low-voltage environment. To accommodate a variety of circuit topologies and allow for the best possible use of board space, the 12-V TrenchFET power MOSFETs include a single n-channel (Si7882DP), a dual n-channel (Si7940DP), and a complementary (Si7540DP) device. Packaged in the low thermal resistance PowerPAK SO-8, the Si7540DP, Si7882DP, and Si7940DP all offer industry-low on-resistance values. The PowerPAK devices' on-resistance times gate charge products result in lower switching and conduction losses and thus higher-efficiency dc-to-dc circuits. The new devices are optimised to provide enhanced efficiency at switching speeds greater than 500kHz. 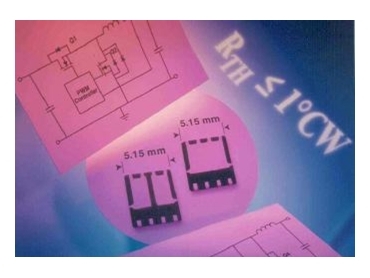 All three devices offer significantly lower thermal resistance compared to MOSFETs in the standard SO-8 package, while measuring just 6.15mm by 5.15mm with a low 1.07mm height profile.